Last week, we wrote about fundraising in the Council At-Large race. Today we put that in perspective. How do today’s campaigns compare to the campaigns of the past? There are two big differences between this year’s Council At-Large race and its three predecessors: 2006, 2010 and 2014. The first is the presence of public financing. The second is the number of open seats. In 2006, there was one open seat vacated by Steve Silverman, who ran for County Executive. In 2010 and 2014, all four incumbents ran again. This year, there are three at-large vacancies – something that has never happened before. One thing that all four cycles have in common is the importance of fundraising. Public financing may have changed the mode by which fundraising occurs, but it did not reduce the centrality of fundraising to the prospect of winning. Raising a lot of money doesn’t guarantee success, but it’s hard to win without it! 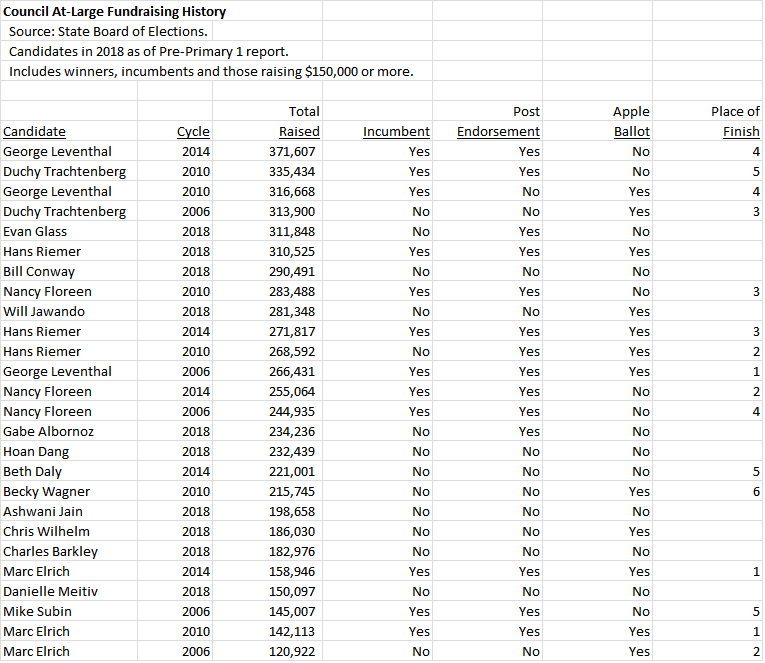 Below is a chart showing fundraising for Council At-Large candidates over the last four cycles. Candidates shown include incumbents, winners and all others raising at least $150,000. Contributions to 2018 candidates go through the Pre-Primary 1 report, which was due on May 22. Incumbency, endorsements by the Washington Post and MCEA and place of finish are also shown. Since 2006, all candidates who raised at least $240,000 won with one exception: Duchy Trachtenberg. In 2010, Trachtenberg – then a first-term incumbent – committed one of the craziest decisions of all time by sitting on $146,000. Rumor had it that she had polls showing her winning and had decided to save her money for a future race, perhaps for Executive. Her fellow incumbent, George Leventhal, edged her out for the fourth spot by 3,981 votes. If Trachtenberg had spent her full sum, she might have been able to send out at least another three mailers and history could have changed. On the other side, no one raising less than $230,000 has won since 2006 with one exception: Marc Elrich. Love him or hate him, Elrich is the exception to a lot of rules in MoCo politics and he has always vastly outperformed his fundraising. Becky Wagner (2010) and Beth Daly (2014) were good candidates but they couldn’t quite raise enough money to break through, even with substantial self-financing. This year, the folks whose fundraising is in the same ballpark as prior winners are Hans Riemer (the race’s sole incumbent), Evan Glass, Bill Conway and Will Jawando. Gabe Albornoz and Hoan Dang are close. The others on this chart are below Daly and Wagner. All of this year’s candidates will raise a bit more money because these figures only go through a month before the primary. But those in public financing – everyone except Delegate Charles Barkley and Ashwani Jain – have already raised most of their funds for this cycle. Public financing does not allow for last-second $50,000 loans or bundled corporate checks to pay for a final mailer or two. Money isn’t everything – just ask David Trone. But it has a role and public financing has not changed that. As we go down to the wire in the at-large race, money matters as much as ever.